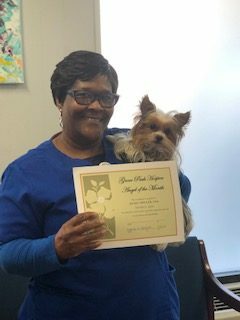 Grove Park Hospice is proud to congratulate Jacqui Shuler, Hospice Aide as our Angel of the Month! Jacqui has been with Grove Park Hospice since 2012, providing loving care to her patients. Jacqui says, “I love being affiliated with hospice care. Because sometime I enter a home where the family as well as the patient feels like this is the end and woe is me. But I want to give them a ray of sunshine during this time. With pleasant happy things. Sometime I get more encouragement than the patient. So it’s an amazing experience for both of us.” We are very proud to have such a loving, caring teammate as Jacqui!